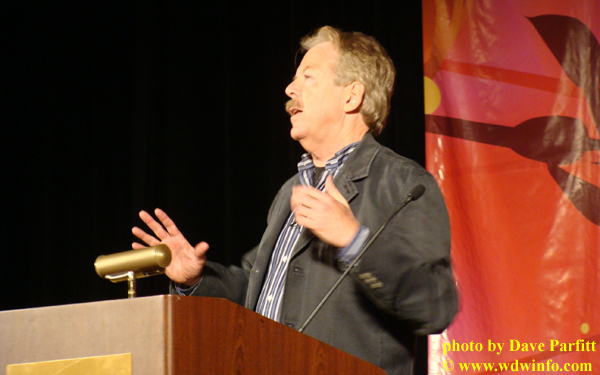 Tony Baxter, the Senior Vice President of Creative Development for Walt Disney Imagineering and the Creative Executive for Disneyland, recently gave the keynote address at the Creative Problem Solving Institute titled “Designing for Disney: Patterns that Embolden Successful Innovation.” A fitting subject for someone who received the Lifetime Achievement Award from Themed Entertainment Association in 2001. After his talk, he sat down with the DIS Unplugged to talk about some of his 40 year career at Imagineering. Continue after the break to listen to and read the transcript of the complete interview. For the audio interview, click here. Tony, thanks for taking the time to speak with us. 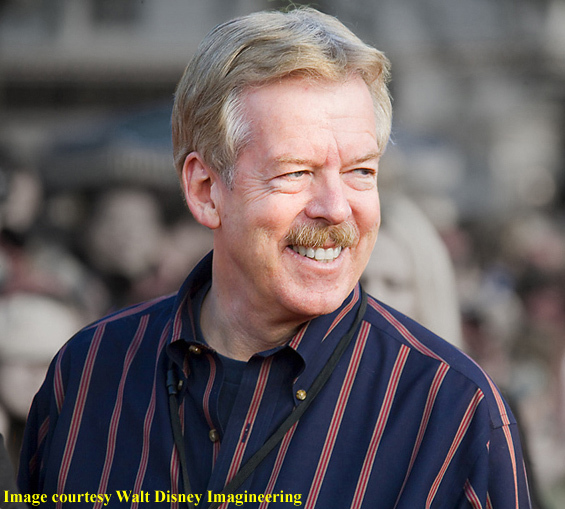 Tony Baxter: Thank you, and I like to call myself an “idea guy.” The pretention of that title is really just to open a few doors, but what I do for a living is come up with ideas. 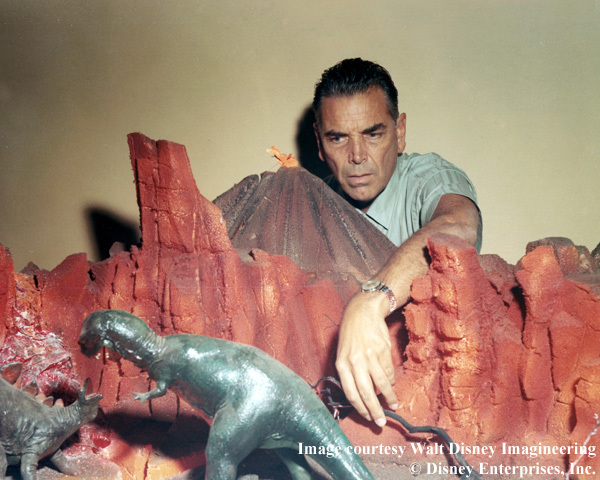 DP: And you’ve been responsible for some big ideas too: Big Thunder Mountain Railroad, the original Journey into Imagination at Epcot, Star Tours, Splash Mountain, Indiana Jones Adventure, and Finding Nemo Submarine Voyage – just to name a few. Could you tell our audience how your career at Walt Disney Imagineering started? 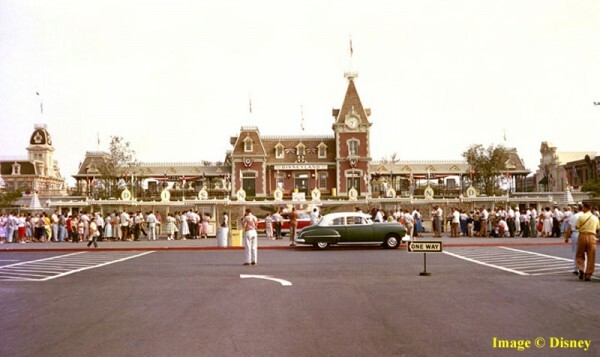 Image: This is a rare color image of opening day taken outside the Main Entrance of Disneyland on July 17, 1955. TB: Well, I grew up as a kid in the shadow of Disneyland. I rode my bike out there, and after turning 16, 18 excuse me, I HAD to work there. There was no ifs or buts about it. I was going to work at Disneyland. I think early on my dream would have been satisfied to just be an operator at Disneyland on Pirates of the Caribbean or something like that. But as I got more or less an education at Disneyland of actually doing what I love to do, I was also getting an education in arts at school starting in architecture and morphing over to theater. I think the combination of the practical at Disneyland with actually working with things and seeing how they get used, what are the problems with moving guests and all that, I learned more there than the techniques I picked up at my formal education. 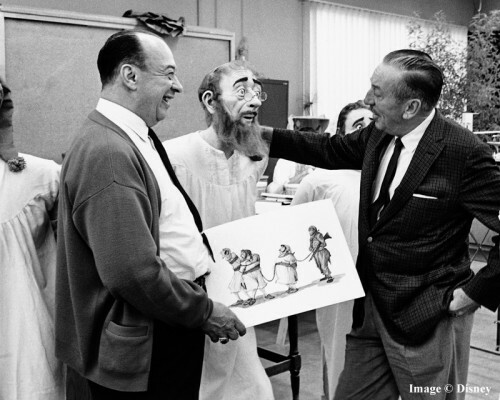 Image: Disney Imagineering Legend Marc Davis (left) looks on as Walt Disney (right) examines their lifelike creation; an Audio-Animatronics figure created for Pirates of the Caribbean which opened at Disneyland in Anaheim, Calif. on March 18, 1967. It was the last Disneyland attraction personally supervised by Walt Disney. But, anyway, out of all that I did some proposals for attractions and I had a crazy contraption that showed a lot of mechanical knowledge but not any educational formal engineering. I took them all up in a van to the place I got interviewed, and out of that came an assignment to work in their dimensional design department. That was the beginning. From there my career went from being in the field, what we called art director, where I helped Claude Coats and some of the early first generation Imagineers like Rolly Crump and Marc Davis. I helped them install their designs, and I learned a lot from that in the field experience. When I came back, I was actually able to come up with my own idea which the first was Big Thunder. So from then on I’ve been one of them. DP: That was exactly what my next question was going to be. 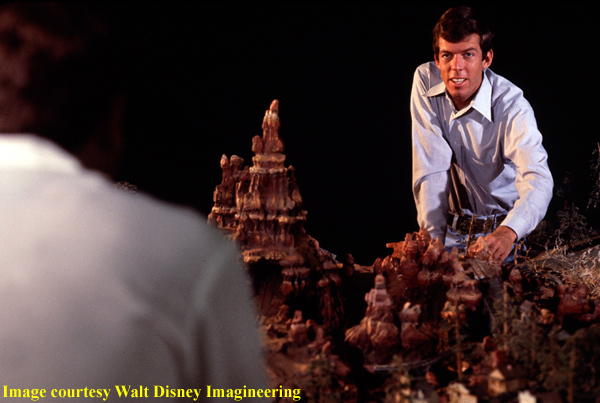 What was the atmosphere like at Walt Disney Imagineering when you first started? TB: Well it was a wonderful period in time, and they were all – and to this day they are talked of in reverential terms. Claude (Coats), I worked a lot with Claude, I respected Marc (Davis), but he was a different sort than I guess I enjoyed working with. The two of them were responsible for kind of… their blended skills created rides like Pirates of the Caribbean and Haunted Mansion. Marc was clearly character driven, and Claude was environmental driven. And that came out of the fact that Marc did so many great characters in film like Malificient and Briar Rose in Sleeping Beauty – where Claude created all these wonderful backgrounds and worlds that these characters inhabited. And Walt (Disney) was smart enough to bring them over to do the same thing in dimension. So I kind of migrated more to Claude because he did the environmental aspects of the shows, he mentored me, and we became very close friends. I couldn’t believe that. I remembered he says, “Well I’m going to go down to the Academy to see the shorts. Would you like to come?” Now would I – this kid who grew up in Orange County, rode my bike to the park – would I like to ride with one of these gods of Disney history, would I like to go and watch the subjects that are up for the Academy Awards? I think I would go. So it was a wonderful time. It’s sad, most of these people are all gone now. There’s maybe two living, and it’s kind of frightening when you think of that. I did feel, what I was trying to say, what do I bring to the equation? These people that were there with Walt – I think the one thing that really is important, people that grew up with a product have an understanding for what it was that made the product special. The people that created the initial product, whether it was film or later the theme parks, they never really experienced it either as a child or as a receiver of that. So they were a little bit less on solid ground when they came up with a new attraction. Most of the classic rides were begun under Walt’s direction. Walt, I believe – I didn’t know him personally, I think he was an eternal child, and he could guide these incredible talents at what would resonate with the audience – because he never let go of that ability to see things in that innocent, child-like way. So it was something that I felt like I could bring, and Claude would rely on me for that. He’d go, “what do you think people will think about this”, and I couldn’t believe that. Card Walker was the President of the company at that time, and he would come over and Claude would say, “Oh, Card you’ve got to see this idea that Tony had.” And I thought, “Wow, that’s amazing, he’s so selfless and so excited about my thing.” So, I’ve tried to remember that now as I work with younger people and try to transfer that knowledge base to yet a third gen Imagineering crew. DP: In your talk today, you talked about “the importance of being 12”, and it sounds like you described Walt Disney as being the eternal child. It sounds like you have a little bit of that in yourself as well. Could you relay your story about some of your formative experiences when you were 12 and how you’ve kept those? TB: When you’re 12 you’re not sophisticated enough to have… the hormones haven’t been racing… you’re not jaded by all the boundaries that society puts on you to be a legitimate adults. I think kids are very brash in what they can say, they can literally, if they don’t like something (they’ll say) “I don’t like this. It doesn’t make sense.” One of the little girls today she took her shoes off in the session. I thought – how many out there have burning feet that would love to take their shoes off, but we gradually get conditioned to what is socially and politically acceptable and you defer to that rather than saying what you honestly believe. If anyone wants a lesson in watching this unfold it’s the movie “Big” with Tom Hanks, where a 12 year old suddenly finds himself as the vice president of a toy factory. Well, he’s the best at it which immediately makes all the real adults jealous. How can this guy come in here and take our jobs away? Because he is still enjoying the product, they don’t have a clue as to whether anybody is going to enjoy the product. The dilemma that the Hanks character has to go through is trying to decide – do I grow up and become a corporate suit and abandon the things that really give me the edge in doing this right? I think that’s the dilemma that everyone faces is how to maintain so much of that that you have at 12 and take it with you and be able to put that hat on and then be able to put your executive hat, or your adult hat, or adult form, on and be able to go back and forth and check it out from the receiving end as well as the politically correct end of things. So I try to do that. I still enjoy the park at that level. Things that I grew up with like “Sleeping Beauty” – I couldn’t believe it I was asked to do commentary on the Blue Ray disc, and I said “About what?” And they said, “Well, you’re embedded in it, you love it.” Now at this point with so many people gone, it’s passing off to people that are just absolutely obsessed with that. But when I saw the dragon in that thing at the end, I was 12 years old, it’s lasted with me my whole career. 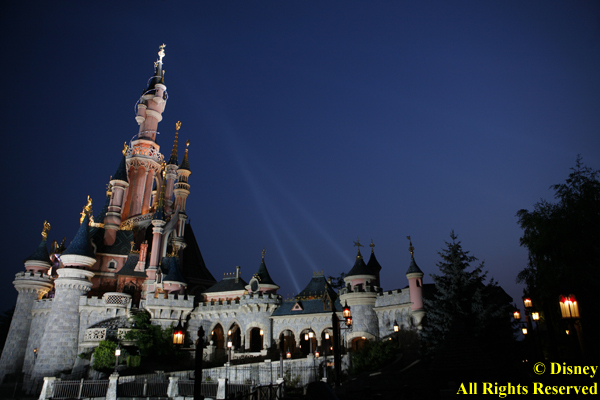 DP: And that’s something you incorporated into the castle at Disneyland Paris as well. TB: I did. I remember painting a dragon when I was in college. It was in my portfolio. Then the opportunity arose when I was leading the creative effort on Paris and I said, “Alright, we’re going to put a dragon in the basement here.” Now it wasn’t a ticketed item. It wasn’t a show or a ride or anything. It was just there. What was interesting is I wasn’t the only one who thought it would be cool to be a dragon. Here in the summer of “How to Train Your Dragon” – that’s kind of fun. But back in ’92 when we did it – it scored as the #3 thing that people talked about when we opened the park. 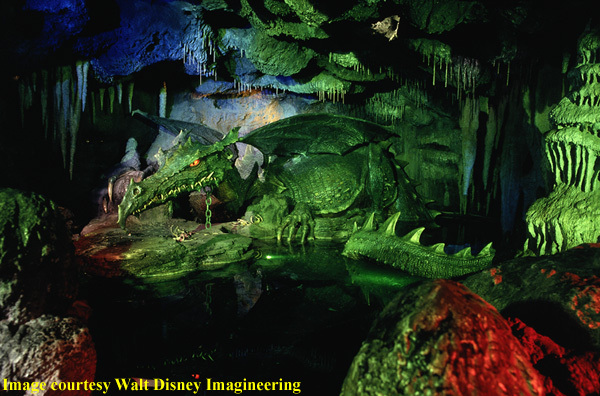 They said rate your [favorites], and they said Pirates and what not, and then “Oh, the dragon in the castle.” They [Disney] had decided that it would be netting zero capacity or value, and yet, our audience was telling us that it was the third most great thing that was there. So, whatever your dragon might be, it’s important to keep it there and never abandon it. Because you got to be able to rejuvenate those feelings that made the dragon very cool – so that you do it right. If you’re trying to suppose what is right – I hear people at work all the time say, “I think the guests will like this.” I go, “Well, what do you think?” Their response is “Oh, I don’t know, we’re doing this for the guests.” I say, “No you’re not.” You may say that. It is the political, right thing to say, but if you’re not going to go on it over and over again because you love seeing it then what makes you think they’re going to want to see it? And whether you’re afraid to, or embarrassed to say you still enjoy things – maybe that’s not the professional way – you have that in the back of your mind that you love these things. There’s examples of things that clearly were not done by people that had that passion in them still, and they may be adequate or whatever, but to get something that’s extraordinary I’m convinced that it has to be led by someone who wants it more than anything to see themselves. 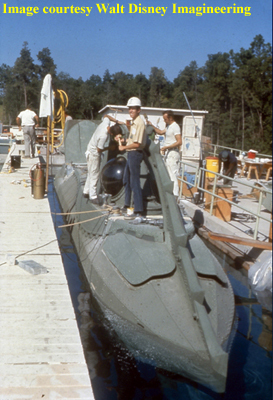 DP: Another thing that seems to be something that you wanted to see more than anything was the return of the submarines in Disneyland. 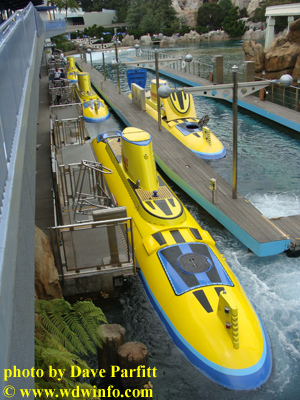 You were heavily involved in the “Finding Nemo: Submarine Adventure” – which I must say I just rode for the first time a couple weeks ago when I was at Disneyland for the World of Color Premiere. I also have a very strong memory of going to Disneyland, riding the 20,000 Leagues Under The Sea Attraction, and was very disappointed when they took it out. TB: Yeah, exactly, to me part of the magic of Disneyland is the diversity of the things you can do at Disneyland that defies all other places you can go on the planet. To think about visiting with a President of the United States, going underwater, riding a flying elephant, and then taking a boat into a jungle, or meeting pirates, the broader that is, the more extraordinary the product is. So when you take out something as totally unique as going underwater in a submarine, people have very little opportunity to do that, and it’s very expensive to get to the Bahamas or Hawaii and spend $100 to go on a ride like that for real. So at Disneyland it was offered up as one of the many things that you could do in a fully immersive day of adventures, and when it was gone, Disneyland became major smaller today. It was in the late 90’s that it left, and it was closed for about 9 years before we reopened with Nemo. All that journey, I constantly had that thing in the back of my head – what is going to “pop” that will be the thing that I can get buy in from all these other votes? Because you have finance, you have marketing, you have all these people that have got a vote, and as long as it’s just bringing back the old submarine, I’m not going to win. But as soon as we went through “Atlantis” and “Treasure Planet” hoping there’d be something, and then finally when “Finding Nemo” came out and captured the world – this little personality of the fish – I said, “there it is. I’m going to get my submarine voyage for the older generation, and it’s going to be filled with fresh, new, emotional content for kids.” And it’s been a hit. DP: It seems like Pixar has a very big place in the park. Could you talk a little bit about the relationship between Pixar and Disney and Imagineering? It seems like it wasn’t too long ago where that relationship was not so close, and when Bob Iger came in [as CEO at Disney] he really solidified that relationship. TB: Yeah, the Disney Company’s had great moments and difficult moments in terms of management structures. There was a rift that was developing between Pixar and the [Disney] studio that wasn’t healthy, and I think when Bob [Iger] came in he realized that one of the key creative talents to keeping the health of Disney was John Lasseter and the Pixar brain trust. They do things in a very child-like way. The last time I was up there they were still in production on “Toy Story 3″ and the unit that was working on it had taken the whole center area around all the offices and made a nursery school – fully functional with all the toys, all the stuff, and certain employees that had small children were encouraged to bring their kids in there. So they were immersed in what it was they were creating. So there’s a very different dynamic at Pixar that’s very healthy. Bob [Iger] saw – yes it’s going to be outrageously difficult to merge them into the company, but it’s critical from, not a financial standpoint, but for creative health. 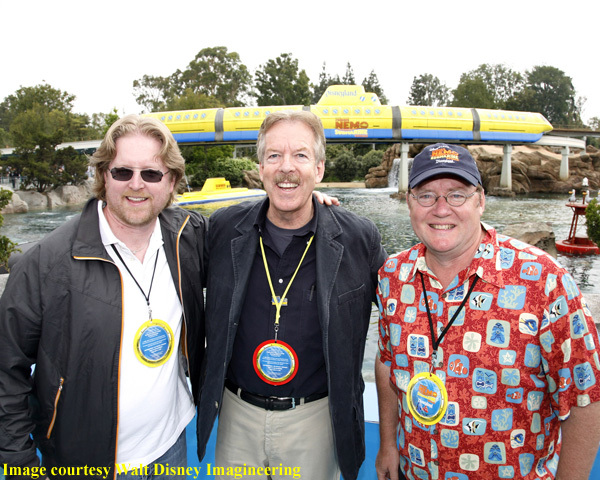 Image: Andrew Stanton (Director, “Finding Nemo”), Tony Baxter, and John Lasseter at the grand opening of the Finding Nemo Submarine Voyage at Disneyland. Really when John [Lasseter] came, and there are others like Pete Docter who are absolutely obsessed with Disneyland, and I think John put it into his contract that not only would he take on the film responsibilities of animation at Disney and animation at Pixar but he had to have his hand in Imagineering as a chief advisor. It’s purely out of that 12 year old mentality that, I think, John has to this day of what Disneyland meant to him growing up in Whittier, CA. He was only about as far away from the park as I was and those visits. When I first met John, he was very cordial and overly nice to me, and I was trying to figure out “What is this about?” I should be agog at you, but it was kind of the opposite. It turned out, he was a ride operator at Disneyland on the Jungle Cruise and had come over and snuck through the fence when I was building Big Thunder. This would happen all the time, so I don’t remember it, whereas for him it was one of those milestone days. I guess I was there and he said – you have a very cool job, how did you get this job? And I said, oh come on, I’ll walk you through the whole ride. I gave him this tour and talked to him about Imagineering. Like anybody that was young and wondering what their future’s going to be it was something that was really important to him. I had had the same thing happen to me with Claude Coats. I had snuck into the pirate ride when I was scooping ice cream at Disneyland. I peeked around the corner and they were doing the work, and I thought I was going to get arrested. Instead, I heard this voice that said, “Oh, you can’t see anything good from there – come on over here!” And it was this guy who was delighted in showing it off – turned out it was Claude, but it was always to me “just this guy.” Years later after I’d been working with him three years, I opened my old souvenir book from Pirates, and I looked at “this guy” in the picture that was in there and went “Oh my gosh, that’s Claude!” It was Claude Coats. So I could hardly wait to go into work the next day and I go “Do you remember a guy in a red and white striped…” He goes, “Yeah, yeah, the guy at the ice cream counter, I used to go get ice cream from him and I thought I’d show him the tour.” As he was saying it he goes, “Nooooo.” It suddenly dawned on him that we’d met, and he had so inspired me with that tour. When they docked me for the hour I was late, I said, “I don’t care.” I had just had the best hour of my career so far. DP: It was priceless. They couldn’t pay you for that anyway. Anything else you want to share with our audience about what’s going on at Walt Disney Imagineering? Things that may be coming up? TB: The exciting thing about Imagineering is, as Walt said, Disneyland, and everything Disney, will never be completed. The technologies just keep giving us new windows. It’s almost overwhelming how many abilities that you have at your fingertips to try out new things. So we’ve got our hands in about five exciting new means of telling story that intrigue me because it allows you to do things you couldn’t do in one of the previous media. Then it all becomes fresh again. You can do things that weren’t possible, then you suddenly go, “Oh, I can do this, and I can do this, so it’s fresh.” Somebody asked today, “What happens when you hit a brick wall?” I was thinking about that after because you have to talk on your feet at one of those Q&A’s. The wonderful thing is when a new door gets unlocked, then all of those boxes that you get trapped in… the lids pop open and you have a whole new world to play in. DP: Well that’s great. 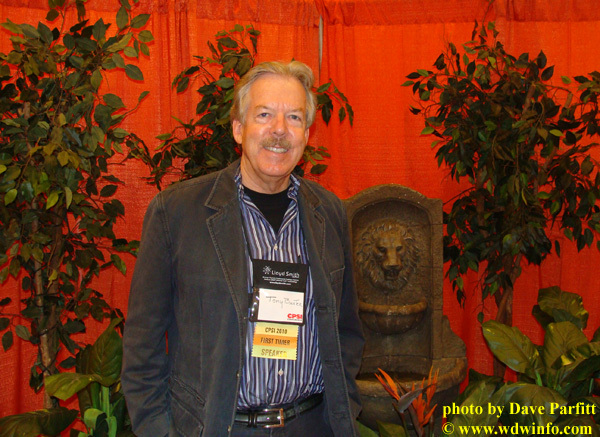 This has been David Parfitt, Senior Correspondent for the DIS Unplugged, talking with Tony Baxter, “Idea Guy” for Walt Disney Imagineering and Disneyland. Thanks again for taking the time to talk with us. TB: And big Disney fan I might add too.